WWE has confirmed the next two matches for Mixed Match Challenge next week. This includes Bobby Lashley and Sasha Banks vs. Jinder Mahal and Alicia Fox from RAW, while The Miz and Asuka will take on R-Truth and Carmella from Smackdown Live. 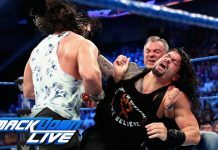 The show airs live on Facebook Watch immediately following Smackdown Live on Tuesday. WWE posted these bonus videos after Smackdown and the Mixed Match Challenge.